LOS ANGELES -- Florida Panthers General Manager Dale Tallon said his goal is to make South Florida a tougher place to visit. He started that process by picking three giant players in the first round Friday, and continued that trend Saturday on Day 2 of the 2010 Entry Draft. The Panthers made 10 of the first 99 picks, and all but one of them was taller than 6-foot and six weighed more than 190 pounds. Leading that group was the third pick of the draft, 6-4, 195-pound defenseman Erik Gudbranson, who could play in the NHL next season. At No. 19 he picked 6-4, 188-pound center Nick Bjugstad, and at No. 25 he selected 6-2, 188-pound center Quinton Howden. "We want to make it tougher to play in Florida than it has been in the past," Tallon said. "Teams have come to Florida on a little bit of a break and come out of there with two easy points. That's not going to happen any more and this is a start. "We're going big and fast. That's what we did in the Windy City and we'll try to do it in Florida. That's what the blueprint is." He stayed with that plan with his three second-round picks -- Sudbury Wolves center John McFarland (6-foot, 192), Red Deer Rebels defenseman Alexander Petrovic (6-4, 193) and Des Moines center Connor Brickley (6-foot, 190). Having McFarland available at No. 33 was a bit of a surprise, as NHL Central Scouting had him No. 15 on its final ranking of North American skaters. "We were looking forward to this morning because he was the first guy on our list coming here and we were fortunate enough to get him," Tallon said. "I like his grit, I like his quickness, I like his shot, I like his determination. His interview (at the NHL Scouting Combine) went really well. … He's got a little dimension of nastiness to him. We're very happy we got him this morning right off the bat." Petrovic was another player who had been ranked highly by Central Scouting that slipped a bit. In all, nine players in the top 30 lasted were available in for Day 2, with six of them being picked in the second round -- McFarland, Petrovic (No. 29); Minnesota State center Tyler Pitlick (No. 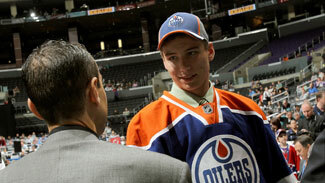 18), who was taken with the first pick of the second round by the Edmonton Oilers; U.S. National Team defenseman Jonathan Merrill (No. 21) was taken by the New Jersey Devils at No. 38; the Los Angeles Kings traded up to No. 47 to select Ottawa 67s center Tyler Toffoli; and the Columbus Blue Jackets moved up to No. 55 to take Rimouski Oceanic forward Petr Straka (No. 23). Also going early in the second round was Central Scouting's top-rated goalie, the Seattle Thunderbirds' Calvin Pickard, who was taken No. 49 by Colorado. "It was tough," Pickard said of sitting through the first round Friday night and not hearing his name called. "I thought I had a good chance of being picked in the first round. But you don't know what the teams are thinking." "It was hard, something you really think about," Toffoli added. "You want to be a first-round pick. I knew somebody is going to really want me. Fortunately enough it was Los Angeles and I'm pretty excited." Other notable players who went lower than expected include three who lasted into the third round -- Moncton Wildcats forward Kirill Kabanov, a first-round talent mired in off-ice issues, who went No. 65; Regina Pats center Jordan Weal, who went 70th to the Los Angeles Kings despite being ranked No. 30 by Central Scouting; and Saint John Sea Dogs right wing Stanislav Galiev, who the Washington Capitals took at No. 86 despite his being No. 20 on Central Scouting's list. Chicago made nine picks and Blackhawks GM Stan Bowman said he had the opportunity to acquire even more picks. "We had opportunities, but we had a lot of picks," Bowman said. "It comes to a point where I didn't want to accumulate more picks than we had. It becomes a timing thing. You don't want to have 12 guys who are all coming due for a contract at one time. You want to balance it out over time. We had opportunities to move other players and we listened. Just never came to be." Other notable players drafted on Day 2 included Oshawa Generals right wing Christian Thomas, son of long-time NHL forward Steve Thomas, taken in the second round (No. 40) by the New York Rangers; Cretin-Derham (Minn.) High School defenseman Mark Alt, son of Kansas City Chiefs All-Pro offensive lineman John Alt, taken in the second round (No. 53) by the Carolina Hurricanes; U.S. National Team forward Jason Zucker, who was born in Newport Beach, Calif., and raised in Las Vegas, was taken in the second round (No. 59) by the Minnesota Wild; Sault Ste. Marie defenseman Brock Beukeboom, the son of four-time Stanley Cup champion Jeff Beukeboom, taken in the third round (No. 63) by Tampa Bay; Harvard defenseman Danny Biega, taken in the third round (No. 67) by the Carolina Hurricanes was the first Quebec-born player selected; Erie Otters forward Andrew Yogan, a native of Boca Raton, Fla., was taken in the fourth round (No. 100) by the Rangers; Gunnery School (Conn.) defenseman Nicholas Luukko, son of Philadelphia Flyers President Peter Luukko, was taken by the Flyers in the sixth round (No. 179); Ilves (Finland) center Joonas Rask, brother of Boston Bruins goalie Tuukka Rask, was a seventh-round pick (No. 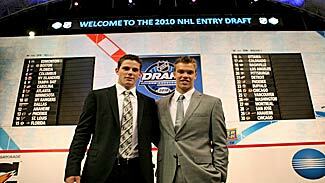 198) of the Nashville Predators; Brendan Ranford, nephew of former Oilers and Bruins goalie Bill Ranford, was taken with the second-to-last pick of the draft (No. 209) by the Flyers. Lake Superior defenseman Zach Trotman was taken by the Boston Bruins with the 210th and final pick of the draft.